During opening-round Four-ball play in the 2019 Zurich Classic of New Orleans, Jhonattan Vegas reaches the par-5 18th green in two, allowing for a two-putt birdie from 90 feet away to get he and Abraham Ancer to 3-under on the day. This highlight is delivered by PGA TOUR LIVE. 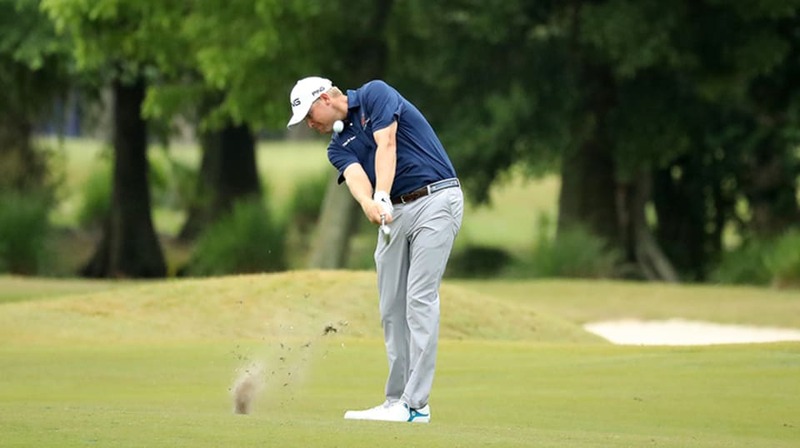 During opening-round Four-ball play in the 2019 Zurich Classic of New Orleans, Kyle Stanley lands his 57-yard approach within 7 feet of the cup at the par-5 18th hole. He would make the putt for birdie to get he and Tony Finau to 4-under for the day. This highlight is delivered by PGA TOUR LIVE. During opening-round Four-ball play in the 2019 Zurich Classic of New Orleans, Tony Finau rolls in a 20-foot putt from the fringe to make birdie at the par-4 6th hole, getting he and Kyle Stanley to 6-under for the round. This highlight is delivered by PGA TOUR LIVE. AVONDALE, La. -- Scott Stallings and Trey Mullinax shot a best-ball 11-under 61 to top the Zurich Classic of New Orleans leaderboard after a weather delay longer than seven hours prevented half of the 80 teams from even teeing off Thursday. In The Takeaway, Teryn Gregson recaps day 1 at the rain-delayed Zurich Classic, where the gators came out for their close-up, Tommy Fleetwood's reaction to the horn blowing said it all and Jon Rahm stayed loosed during the delay at the New Orleans Saints practice facility on draft day. In the opening round of the 2019 Dormie Network Classic at Briggs Ranch , Brian Richey and Xinjun Zhang are tied for the lead after shooting matching 9-under 63's. During opening-round Four-ball play in the 2019 Zurich Classic of New Orleans, Brooks Koepka gets up-and-down from just short of the green to make birdie at the par-4 13th hole and get he and Chase Koepka to 1-under for the tournament. During opening-round Four-ball play in the 2019 Zurich Classic of New Orleans, Bubba Watson sinks a 19-foot putt to make eagle at the par-5 2nd hole, getting he and J.B. Holmes to 2-under on the day. During opening-round Four-ball play in the 2019 Zurich Classic of New Orleans, Nick Taylor rolls in an 18-foot putt to make birdie at the par-3 14th hole and get he and Martin Laird to 3-under for the round. Paul Goydos and Kevin Sutherland visited the Bass Pro Shooting Academy during the Bass Pro Shops Legends of Golf. Trained shooters used shotguns to fire at flop shots hit by Goydos and Sutherland.